Our goal at Orovale Leos is to preserve and improve upon the quality and soundness of the breed, by striving to produce dogs that are structurally strong and elegant, of great temperament, and excellent health. To this aim, prior to being bred, our dogs are certified for hips, elbows, eyes, heart, and thyroid. 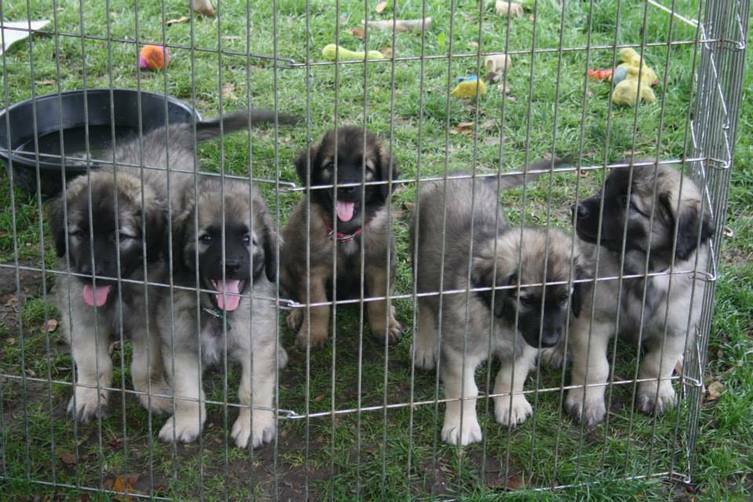 They are also screened for inherited Leonberger Polyneuropathy (LPN1 and LPN2 tested) and Leukoencephalomyelopathy (LEMP). We do this to ensure that we are doing everything we possibly can to breed dogs that will produce puppies that live healthy and happy lives. Our puppies are born and raised in our home, and are exposed to a variety of sounds, surfaces and activities designed to socialize and instill confidence. In addition to being given lots of love, they are handled by us on a daily basis to get them used to being touched all over their bodies. Not only is this an integral part of early socialization to humans, but it is also essential for helping the puppies form positive associations with being handled later in life. Because our puppies are very important and special to us, we do our best to find equally special homes for them. For this reason, all potential puppy owners are required to complete a detailed questionnaire. We then use this to make the best fit for your family, your lifestyle and, most of all, the puppies. If you are interested in more information and / or being placed on our waiting list for our next litter, please contact us.